Everything is better when it’s grilled! This might be true, except for the times when grilling leaves you with dry, chewy meat. We’ve all tasted bad grilling at least once in our lives. What if there was a way to avoid this disastrous dryness? There is, and that’s why we’re going to take a look at the best infrared grills. Traditional gas and charcoal grills cook using convection heat. Infrared grills, on the other hand, cook using radiant heat. What is so great about radiant heat? Radiant heat provides a consistently even grill surface which makes for more flavorful food. It can even save on fuel. Infrared grills have been around for a while. Their rise in recent popularity though comes from more and more people discovering just how good they can be. Are you looking to buy the best infrared grill in time for your next party on the patio? We are going to examine the infrared grills pros and cons and tell you what to look for when comparing models. We will also take a look at a few of the best infrared grills on the market, whatever your budget may be. 1 What is an infrared grill? 2 How does an Infrared Grill work? 3 Why do you need an Infrared Grill? What is an infrared grill? An infrared grill is simply a grill that contains a burner that utilizes infrared radiation as a heat source. Conventional style gas burners will produce a heat that is very diffuse and flows around the meat through air or liquid. Infrared grills don’t require a medium for that heat to travel through because they use radiant heat. Infrared may sound like something a bit more scientific than your regular charcoal or gas grills. That’s because it is! On the electromagnetic spectrum, you can find infrared waves in between visible light waves and microwaves. Infrared heat occurs naturally and can actually be found in any type of grilling from wood to charcoal. However, infrared grills (those designed specifically to utilize infrared radiation as a heat source) are able to reach temperatures other grills cannot. The best infrared grills can even reach over 1,000 degrees Fahrenheit! How does an Infrared Grill work? The moisture boundary is what surrounds your meat during grilling. The hot air of convection cooking methods such as gas and charcoal disturbs this protective layer of air and water. Think of it like a high powered hair dryer blowing over your meat. This leads to your food drying out quickly. With infrared grills, it is the meat –NOT- the air that is heated, therefore leaving that moisture boundary intact. Your food retains its own natural juices, keeping it tender and delicious! There are several different types of infrared grills. One common design features a burner that contains a gas chamber covered by radiant panels. The perforated panels usually have a mesh grate encasing them. This burner heats the cooking grate, placed just above the infrared panels. The radiant panels are what ensure an even cooking temperature across the entire cooking surface. Why do you need an Infrared Grill? Infrared grills are simply one of the best ways to grill outdoors because of the high-quality results. Being able to sear at high temperatures without drying out the meat means your food is always juicy and tender. You will have a steakhouse quality sear every time, and your meat will retain much more of its natural juices. Infrared grills are also much quicker to use, as they preheat within a few minutes and cook the food faster than traditional grills. That faster cook time means you will likely get more use out of an infrared grill, as it is less of a hassle to use after a long day at work. Its cleanup is also quick and easy, and you don’t have to worry about nearly as many flare-ups during cooking. Many infrared grill owners swear by this method, and more and more we are hearing infrared referred to as a “must have” quality in a grill. The undeniable truth about the best infrared grills though is that they are far superior in regards to the taste they provide. Char-Broil is one of the most widely regarded names in outdoor entertaining. The Char-Broil Performance TRU-Infrared 500 does not disappoint. Featuring 500 square inches of cooking space, this grill rates as one of the best infrared grills under 500. The TRU-Infrared system is no joke. It heats almost instantly and provides even heat across the porcelain coated grates. This model also features a 10,000 BTU side burner which makes for the perfect place for cooking side dishes. It also has a 180 square inch swing away rack. The three burners have top ports, making them easily adjustable and capable of producing temperatures that range from low to very high. This bad boy is built to last! The Royal Gourmet Mirage boasts an impressive 697 square inches of cooking space and a total BTU output of 96,000. It features stainless steel tube burners, a brass side burner, and a rear infrared burner. The split lid design gives you more control over temperature when cooking different types of food at the same time. 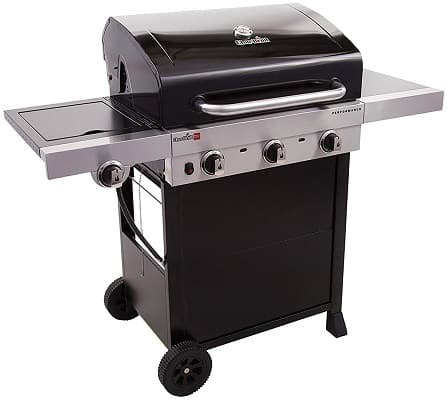 With ample storage space in its enclosed cabinet base, stainless steel side shelves, and a 264 square inch warming rack this grill is the real deal when it comes to extra features. When it comes to appearance and function, the Royal Gourmet Mirage brings the most bang for the buck. It is one of the best infrared grills under 1000 dollars, a bargain for all that this grill can do. 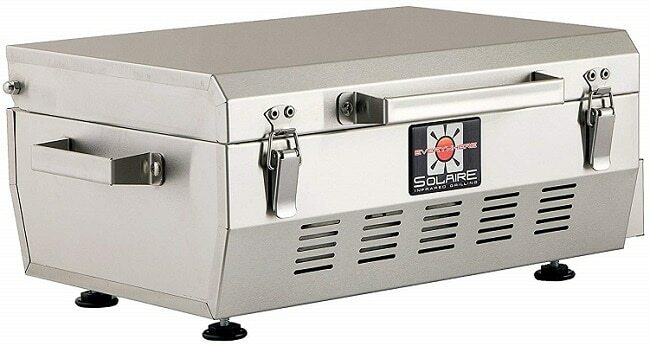 If you are looking for a grill that is 100% infrared and also 100% portable, look no further than The Solaire SOL-EV17A. Its ceramic and stainless steel burner comes with a push-button ignition and is the perfect addition to any camping trip, tailgating party, or picnic. You can get that delicious infrared steakhouse sear anywhere you go with this model. You can fit up to six burgers at a time on its 140 square inch cooking space. Weighing in at only 15 pounds, this infrared grill is convenient and compact. It also happens to be one of the best infrared grills under 300. This is also a great model if your outdoor space is limited. Read our other recommendations for portable grills. Surprised to see Char-Broil twice on this list? We aren’t. 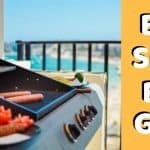 It’s one of the top performing brands when it comes to grills, and their infrared models rank among the best infrared grills. The Performance TRU Infrared 450 is slightly smaller than its sister the TRU-Infrared 500. 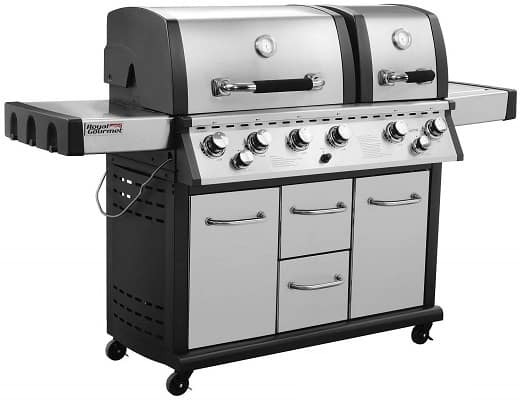 The 450 model also features the same TRU-Infrared technology, 10,000 BTU side burner, the top ported tube burners, and a swing away warming rack. So, what is the difference between the two? Even though you lose 50 square inches of cooking space with the 450, you also lose a lot off of the price tag. The Char-Broil Performance TRU Infrared 450 is perfect for your smaller sized grilling needs and is one of the best infrared grills under 300. Just as Napoleon Bonaparte was known for his power and prestige, you can expect to find the same qualities in the Napoleon Grills Prestige 500. Perhaps the Best Infrared Grill 2018, the Prestige 500 is a massive infrared grill capable of conquering any size feast. The Prestige 500 totes some impressive numbers: 66,000 BTU’s, 5 tube burners, and 760 square inches of cooking space. It’s not just an infrared grill though! The front burners run on propane. The infrared burner in the back includes a heavy duty rotisserie. There’s also an infrared side burner for quick searing. There’s one other impressive number about the Prestige 500 – its price. At regular price, expect it to be in the four-figure range, but not by much. On sale, you may get the best infrared grill under 1000. But with all that this beautiful machine is capable of, we consider it well worth the cost. The Char-Broil Big Easy TRU-Infrared Smoker and Grill packs in the perfect combo of infrared grill and smoker. It also happens to be one of the best infrared grills under 300. Beyond that, it also made our list of best gas smokers, meaning this model can really hang with the big boys. 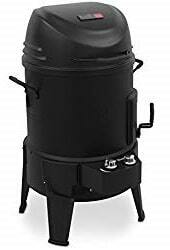 The Char-Broil Big Easy TRU-Infrared Smoker and Grill is very versatile and a particularly great model if you are new to infrared grilling or new to smoking. The infrared heat source helps to actively eliminate flare-ups and keep the cooking surface at an even temperature. Forget the drip tray and dampers! They aren’t necessary, making this grilling experience entirely uncomplicated. Steakhouse Quality Sear – Infrared grills pack a serious punch in regards to temperature capabilities. Some of the best infrared grills can reach temperatures of over 1,000 degrees Fahrenheit. Searing locks in the moisture that keeps your meat juicy and tender. Quick Preheat – Go from preheating to grilling in next to no time! Most infrared grills will preheat in under three minutes! Decreased Flare-Ups – Forget flare-ups from grease and food particles! Infrared grills keep your grill temp as consistent as possible, which reduces (or even eliminates!) the chances of flare-ups. Faster Cooking – Quicker than other methods, infrared grilling means you can come home after a long day and still have time to make a delicious, grilled meal. Taste – Meat retains more of its natural juices when cooked using radiant heat, so you can expect your food to come out tender, juicy, and delicious every single time. Energy Efficient – Who doesn’t love a grill that saves you money? Infrared grills burn less gas to reach the same temperatures as other grills. Quick and Easy Cleanup – Once you have finished your meal, your infrared grill can be quickly cleaned by simply setting the heat to high to burn off any remaining food particles. Price – Infrared grills come equipped with some pretty fancy technology, so you should expect their price tags to reflect that. They are generally pricier than your standard gas or charcoal grill. Takes Practice – Infrared grills operate at insanely high temperatures, so make sure you are paying attention while grilling. The chances of burning or charring your meat are high, but practice will make it perfect. Temperature Range – We have discussed how well the infrared grill works with high temperatures. However, when it comes to low temperatures, there isn’t the same level of control. If you are hoping to cook vegetables and fish, you may find the infrared grill to not be up to par. Portability – Infrared grills can be bulky and heavy, so don’t expect to be moving it all around your backyard. Lighter weight models are available, but they often lack some of the essential features of an infrared grill. 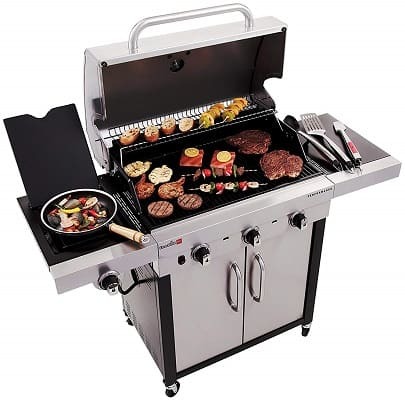 Infrared grills typically range in price from just under 300 to over 1,000. Higher end models are typically more well built and include extra features or a larger cooking space. However, you can still find plenty of models that are more than adequate and also more affordable than those on the higher end of the price scale. Most infrared grills are big and bulky, but when it comes to the size of the cooking space, they all tend to differ. Typically, 300 square inches of cooking space is fairly adequate for a small family. But if you plan on cooking for larger parties, factor in additional space for your ideal model infrared grill. Infrared grills provide higher levels of heat at a much faster rate than other grills. The best infrared grills can reach over 1,000 degrees Fahrenheit. However, if you plan on cooking foods that require lower heat levels (such as vegetables or fish), make sure to pick a model that is capable of both high and low temps. Some infrared grill models are entirely electric. 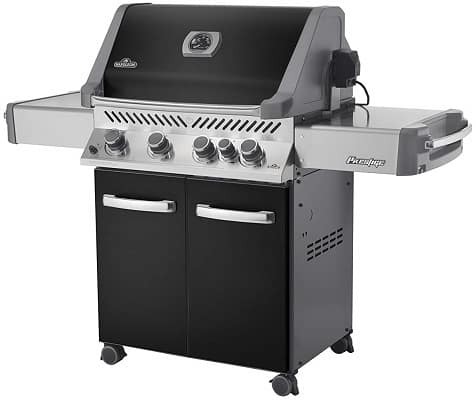 Other models require propane refills just like a gas grill; however, they are more energy efficient than gas. They burn far less gas to reach the same temperatures as traditional gas grills. Portability is one of the disadvantages of owning an infrared grill. They are rather large and bulky and can be difficult to transport. However, there are several models available that include wheeled legs for increased portability. You can also find several small models of infrared grills that are made with the sole intent of being portable for picnics, tailgating, camping, and more. Many of the big-name manufacturers include their own 1, 3, or 5+ year warranty. Purchase an additional warranty if you feel it necessary. However, if you are taking proper care of your grill in regards to upkeep and maintenance, then you will ensure that your grill stands the test of time. A grill cover is a necessary investment. Read more about the Best Grill Covers and other methods of maintenance. Infrared grills can reach significantly high temperatures. It is a good idea to have your own thermometer to check the meat’s surface temperature and the surrounding grill. Infrared thermometers give you the capability to measure the temperature from a distance without poking or prodding the meat. Read about our suggestions for the best grill thermometers. 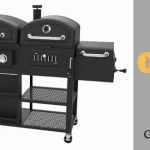 If you are not ready to take the plunge into a fully loaded infrared grill, you can get the best of both worlds by opting for a conventional grill that contains an infrared side burner. Some conventional grills are customizable after-market. So, if you are handy, you can add an infrared side burner to a grill you may or may not already have. To ensure that your grill stands the test of time, make sure you are cleaning the grates properly in between each use. Read up on our tips for the Best Grill Cleaner, BBQ Brush, Scraper & Hacks for Cleaning Grates because no one wants ash or paint chips in their food. You may have noticed that many of the grills we have mentioned so far are not 100% infrared. There are two brands, however, who make grills that are entirely infrared – Tec and Solaire. These two rank highly among the best infrared grill brands. Both brands come with an excellent build quality and have the price tags to prove it. If you want to cook solely using infrared and want a grill that can stand the test of time, Tec and Solaire are great options. Keep in mind though that these grills are only made for very high heat, and there is not an option for low cooking temperatures. Of those grills that are partially infrared, we consider the best infrared grill brand to be Char-Broil. There are a wide variety of models, and you get a much wider range of temperatures than with Tec or Solaire. You can cook on high temps for your meats and low temps for your vegetables. Char-Broil grills work well, are affordable, and are great for all experience levels from beginner to expert. They may not last quite as long as their more expensive counterparts, but Char-Broil puts out a quality product when it comes to the best infrared grill brands. Now you know how infrared grills work and why they are making waves in regards to popularity. We also told you how infrared stacks up against charcoal, gas, and other grilling methods. Are you ready to take the plunge into owning your own infrared grill? 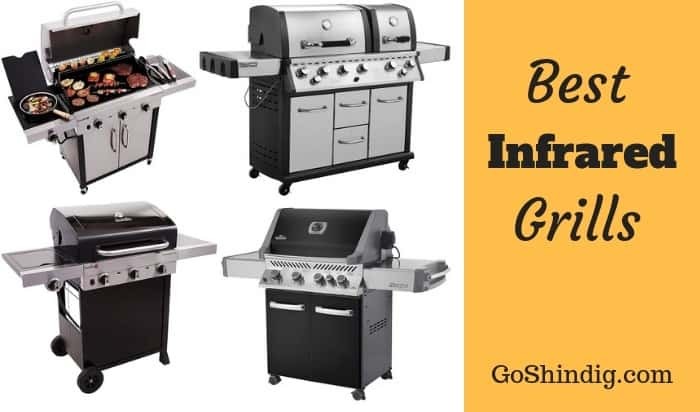 There are so many infrared grills on the market and so many options to choose from. We would love to hear your results! Do you see a difference in the tenderness and juiciness of your food with infrared?